The Fed, by tightening, is reducing “slack”! As a result, important questions confront monetary policymakers in the United States, including when and how quickly to continue normalizing interest rates. Why are they so worried if inflation, as measured by the PCE-Core has remained below the 2% target level for almost the whole time since end-2008, even if “full employment” is all around us? What they don´t realize is that “slack” has been diminishing because they are keeping the economy ever more subdued. The idea of “potential” is risible because actual NGDP seems to be the strongest determinant of “potential” NGDP. In the chart you can see that while for the years prior to 2013 potential NGDP in the latest vintage (August 2016) was revised slightly up, compared to the 2011 vintage (the earliest available in Alfred), for the past two years it was revised down significantly. Now, note that´s exactly the period during which NGDP growth has tumbled down, the outcome of all the tightening talk going on at the FOMC! HILSENRATH: Dennis Lockhart, president of the Federal Reserve Bank of Atlanta. We’re here in Jackson Hole, talking about the economy. So give us your read: How is the U.S. economy doing right now? LOCKHART:I think the U.S. economy is expanding at a modest pace. The second quarter (gross domestic product) number—which was 1.1 (percent annual rate of growth), just revised slightly yesterday—I think overstates the slowdown or a slowdown. We have been looking through that number to an account in the GDP accounts called real final sales, which is GDP less inventory. And what we see there is a better picture and a more consistent picture over the last few quarters. So I think the economy is chugging along, and I’m not one who is interpreting the headline GDP number as somehow suggesting that we have slowed from what was already a slow expansion. The picture over the past two years strongly contradicts Lockhart: The economy has been slowing for the past two years. That´s not surprising because all those measures of aggregate nominal activity give out the same information over long periods. ABSTRACT The two official measures of U.S. economic output, gross domestic product (GDP) and gross domestic income (GDI), have shown markedly different business cycle fluctuations over the past 25 years, with GDI showing a more pronounced cycle than GDP. This paper reports a broad range of results that indicate that GDI better reflects the business cycle fluctuations in true output growth. Results on revisions to the estimates, and correlations with numerous other cyclically sensitive variables, are particularly favorable to GDI. 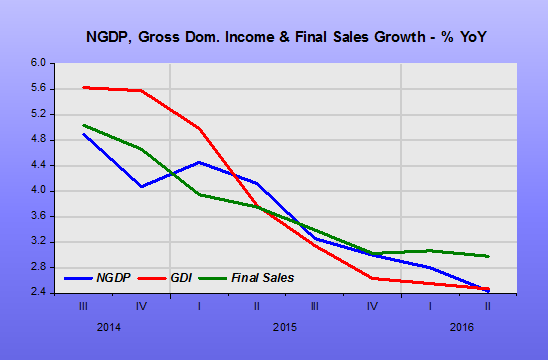 The most recent GDI data show the 2007–09 downturn to have been considerably worse than is reflected in GDP. 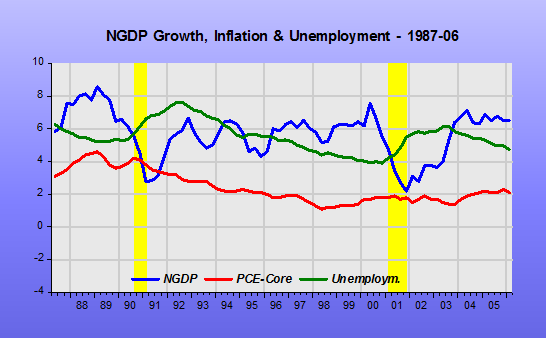 The last blog post was a great analysis of the last thirty years of US monetary policy as the Fed focused on Core PCE inflation and unemployment and for most of the time accidentally got NGDP growing on target. 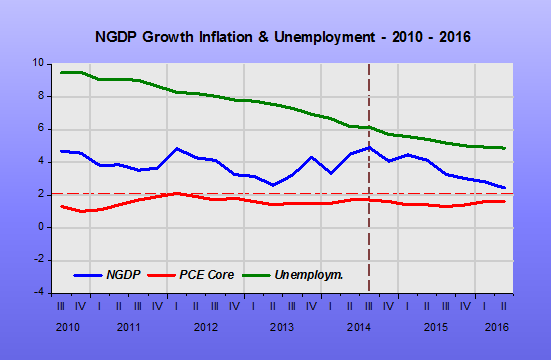 When the Fed switched rigidly to focusing on its own projections for Core PCE things started to go awry, both with unemployment and NGDP. Still focusing on those projections since 2009 it has got things right in fits and starts only. Unemployment has ever so gradually returned to 5%, a record slow recovery. That said, there is still tons of labor market slack as evidenced by the participation ratios, ultra-low nominal wage growth and low quit rates. These factors mean there is very little productivity growth as the labor market is so lacking in energy. Core PCE keeps missing Fed projections of a return to 2%. This troubled but not yet terrible situation is summed up by, actually caused by, the dreadful growth rate and level of NGDP. 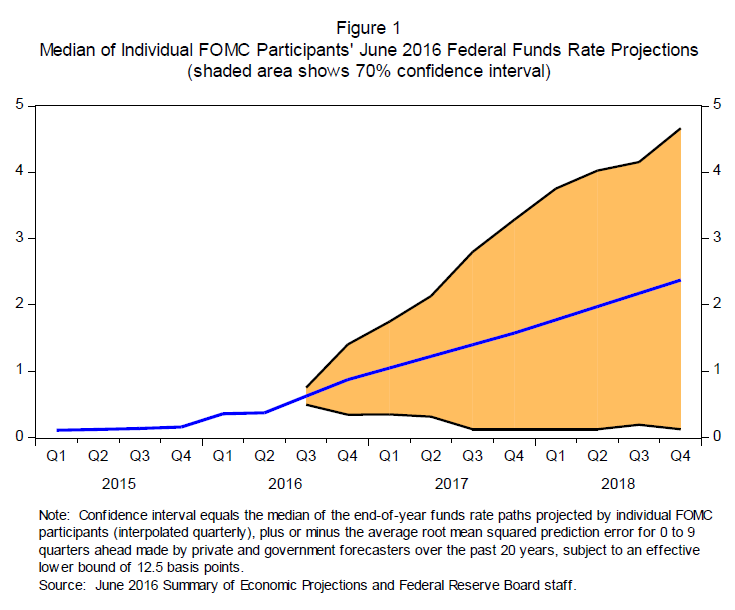 So why does the Fed want to raise rates? 1. The Fed wants to raise rates to give it the room to cut them when the data goes bad – even though we know the data will go bad due to the raising of rates, or the constant threat of raising rates. 4. So the Fed has to look at more innovative alternatives than negative rates or more/wider QE. Thus it is tentatively looking at a higher inflation target or even level targets for inflation or nominal growth, instead as a sort of last resort back-up plan. The Fed is causing this confusion because the logic is confused. It has the wrong targets and they are both causing and storing up trouble. Changing the targets would be the right thing to do, even if for all the wrong reasons. During the Great Moderation, the Fed did do wrong. It just didn´t fail utterly! I believe the chart tells a convincing story. 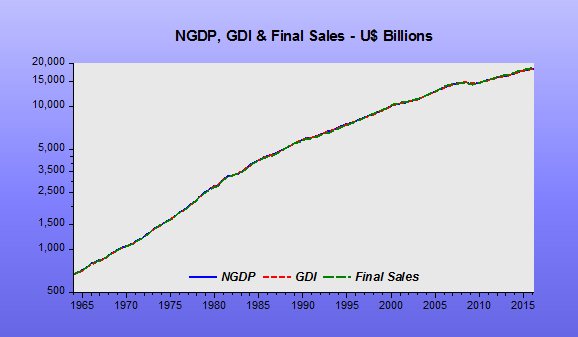 Note that during the Great Moderation – the Greenspan years – NGDP growth was relatively stable. In 1990-91, the story is the Fed engineered a “strategic Disinflation”, with inflation coming down from the 4% level to 2%. 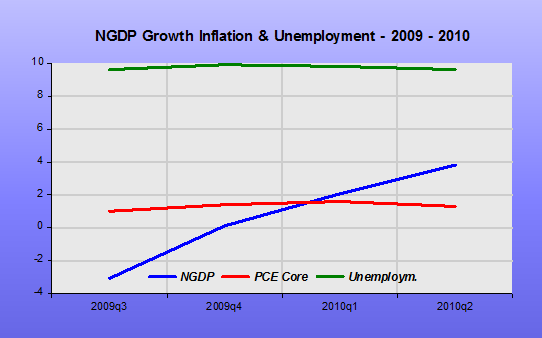 In 2000-02 the Fed, worried about the low (4%) rate of unemployment and what it would do to inflation, erred, allowing NGDP growth to fall significantly. This mistake was subsequently corrected. 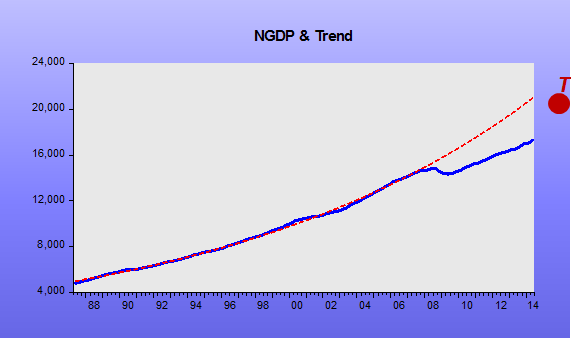 In level terms we see that NGDP remained close to its “target level”. 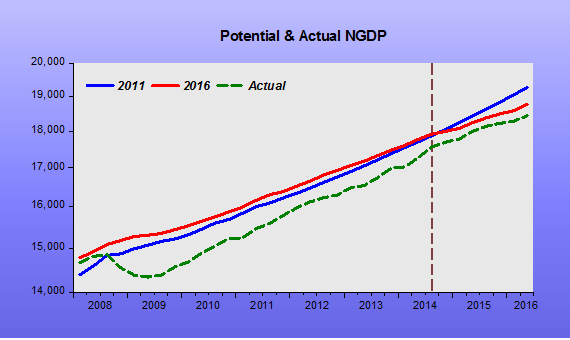 In the first two years of his mandate, Bernanke managed to keep NGDP close to its “target level”. Inflation remained very close to target and unemployment low and stable. The follow-up in 2008-09, however, was a disaster. 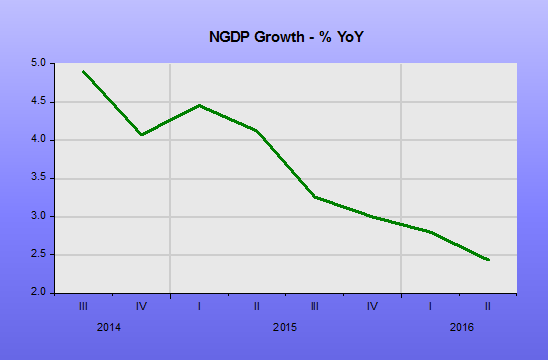 The Fed allowed NGDP growth to take a beating. The result was a massive increase in unemployment (given wage stickiness) with inflation dropping below target. This outcome is very closely linked to the Fed´s renewed obsession with the likelihood of inflation shooting up on the heels of an oil shock. This is somewhat surprising given that 10 years earlier, in 1997, Bernanke and co-authors had published a paper “Systematic Monetary Policy and the Effects of Oil Price Shocks” (now gated), which was summarized by Business Insider in March 2011, at the time the ECB was considering hiking rates because of the oil price rise. CNBC is talking about it today, too, in light of the ECB’s talk of higher rates. In 2008, however, the Bernanke Fed was very worried about the inflationary impact of oil. 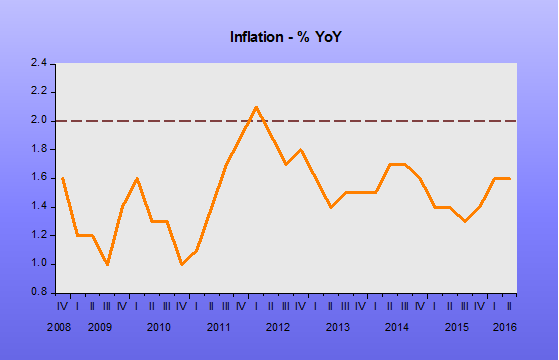 Although the Fed didn´t raise rates (they didn’t lower them either between April and September 2008), all the FOMC talk, as gleaned from the 2008 Transcripts, was about the risk of inflation and how the next rate move would likely be up! “Fed talk” is monetary policy, and it gets transmitted through the expectations channel. You get the idea about how monetary policy was severely tightened during 2008, in addition to looking at the behavior of NGDP growth, that tanked, by looking at how the dollar strengthened, how the stock market plunged, and how long-term interest rates dropped. 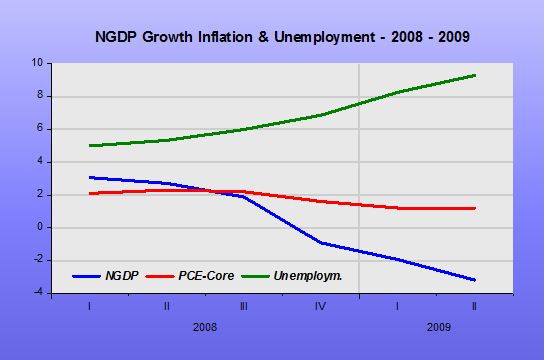 In mid-2009 the economy began to recover, with NGDP growth reversing course. QE1 had a positive impact. During this policy easing, the dollar fell while stocks and long-term bond yields rose. For some reason, by mid-2010 the Fed decided that “enough was enough”. 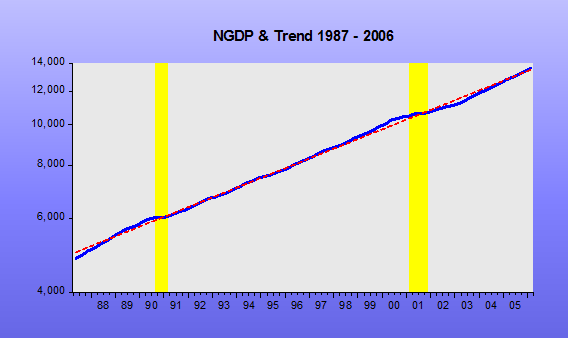 QE1 ended and NGDP growth was stabilized initially at 4%. 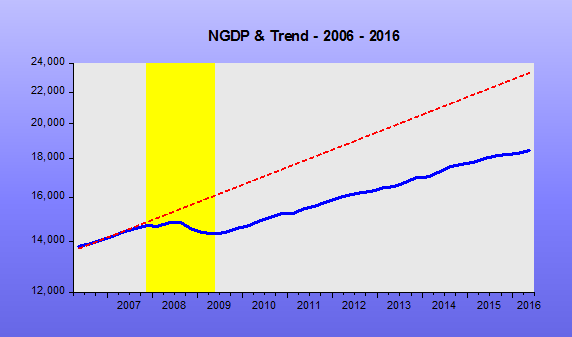 In other words, unlike after the 2000-03 when NGDP fell below trend but was brought back to trend, this time around the Fed decided that a lower trend path was the way to go. For the past two years, even with inflation remaining below target, through its raise hike talk the Fed has been tightening monetary policy. 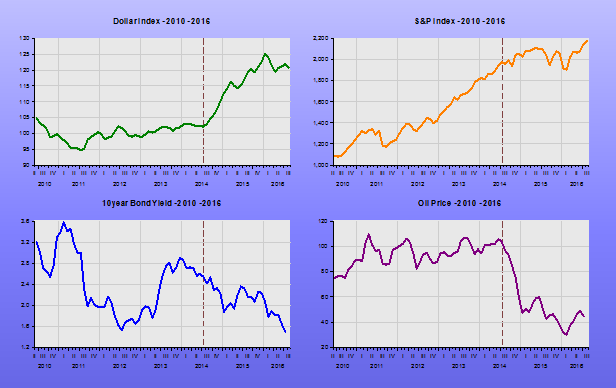 NGDP growth is coming down, the stock market has remained sideways while the dollar has boomed, oil prices have tanked and long-term bond yields are coming back down. It seems the Yellen Fed is guided by the unemployment rate. The Jackson Hole Conference had an encouraging title: “Designing Resilient Monetary Policy Frameworks for the Future”. Unfortunately, they mostly talked about the nuts & bolts of policy implementation. Furthermore, while Yellen signalled one rate rise this year, her number 2 Stan Fischer said he “roots” for two. And Bullard said once in the next two years! It was certainly a missed opportunity for the Fed to regain some modicum of credibility. The Fed may have cried wolf a few too many times recently. But investors should remember that in the original parable, the wolf did show up eventually. The time to start preparing for higher rates is now. How best to prepare? By level targeting NGDP. …if a central bank wants to hit a higher inflation target, it has to set nominal interest rates higher, on average. So, in the course of transitioning to a higher inflation target, the central bank must, at some time, have to raise nominal interest rates in order to produce higher inflation. But then, it must be true that, if the central bank has an inflation target of x%, and inflation is persistently y%, where y < x, then the central bank must raise its nominal interest rate target. Since the Fed is so keen in doing exactly that, it should try it. If it doesn´t work, just blame St Louis Fed VP Steven Williamson! …my primary message today is that I expect monetary policy will continue to play a vital part in promoting a stable and healthy economy. New policy tools, which helped the Federal Reserve respond to the financial crisis and Great Recession, are likely to remain useful in dealing with future downturns. Additional tools may be needed and will be the subject of research and debate. But even if average interest rates remain lower than in the past, I believe that monetary policy will, under most conditions, be able to respond effectively. Unfortunately, that is not happening. As illustrated in the charts, monetary policy has been overly tight, with a brief respite. 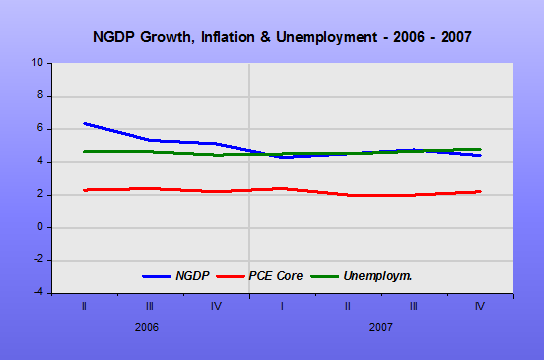 Why they don´t perceive this and make a real effort to overhaul the monetary policy framework is beyond comprehension! The Jackson Hole 2016 gathering just started. The Conference Title is Designing Resilient Monetary Policy Frameworks for the Future. However, the session directly linked to the Conference Theme – Evaluating Alternative Monetary Frameworks – is a letdown of massive proportions. Jean Pierre is a Finance person and Simon Potter is an econometrician (time series) and forecaster. Hope I get pie in the face! The Federal Reserve’s governors are debating what is going on in the U.S. economy and how to set policy, the Fed’s No. 2 official said on Thursday. “The issue of overheating of the economy is being discussed within the Fed board,” Fed Vice Chair Stanley Fischer told a room of labor activists who met with Fed officials to press them not to raise interest rates. “Everything that’s being argued here is being argued in the board as well,” said Fischer. …How might these problems be fixed? One possibility is simply to raise the inflation target to, say, 4%. Credibly enacted, that ought to alleviate the risk of impotence. If investors and consumers believe inflation will reach 4%, nominal interest rates should eventually rise to 5% or so even if real rates stay low. But rich-world central banks have undershot their targets for so long they may struggle to persuade the public to expect higher inflation. And a higher target would still leave central banks with a dilemma when economic growth and inflation diverge. Neither would it make up for big misses. A more radical option is to move away from targeting inflation altogether. Many economists (and this newspaper) see advantages in targeting the level of nominal GDP, the total amount of spending in the economy before adjusting for inflation. 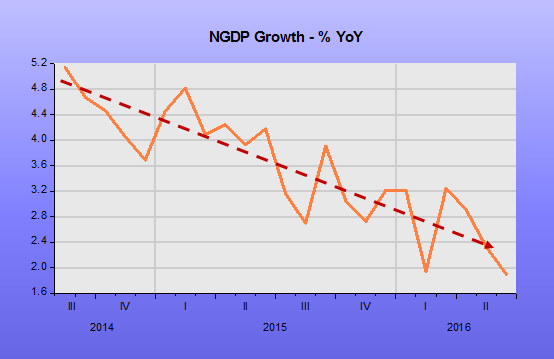 A nominal-GDP target would allow for temporary variations in inflation. Downturns would be tempered by an expectation of protracted stimulus later on to make up lost ground. In better times, a rise in real GDP would provide the lion’s share of the required nominal-GDP growth and inflation could drift lower.